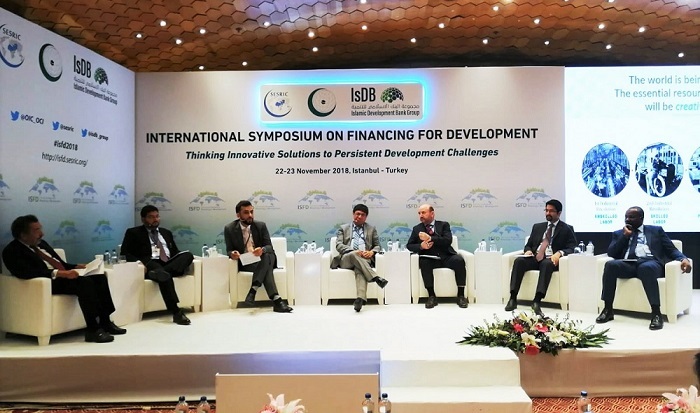 SESRIC and the Islamic Development Bank (IsDB) jointly organized an International Symposium on Financing for Development, between 22 and 23 November 2018 in Istanbul Turkey. The 2-day Symposium was held under the theme of "Thinking Innovative Solutions to Persistent Development Challenges” and was attended by representatives of national institutions, international organizations, private sector and academia. The event provided an important platform for discussing the problems and alternative solutions related to financing development in OIC countries. A special session was allocated to academicians to share the outcomes and policy recommendations of their research during the Symposium. The Symposium included presentations and discussions on current global issues, challenges and approaches in financing for development with a special reference to the developing countries in general and OIC countries in particular. The discussions mainly covered global perspectives and experiences of intergovernmental organizations and major donor countries on financing for development. Key obstacles and institutional challenges faced by developing countries and OIC Member States were also addressed during the Symposium. The current 56 member countries of the OIC are highly diverse in terms of their level of economic development and many of them require a substantial amount of resources to finance their development. Due mainly to lack of adequate resources and ineffective use of existing resources, these countries continue to face persistent development challenges. On the other hand, there are also a growing number of OIC member countries that have been active in supporting development in other developing countries, but their role in development assistance is not properly recognized at global levels. In order to address the development finance challenges, alternative mechanisms are being voiced across the globe. A particularly strong mechanism that becomes increasingly popular is the Islamic finance instruments in financing for development, which can be instrumental for OIC countries in fostering development when effectively utilized. In this connection, the Symposium elaborated the opportunities for innovative financing mechanisms, including Islamic finance instruments, as well as effective utilization modalities of existing resources for financing development in developing countries, with a particular focus on OIC member countries. It also highlighted and discussed the growing role of some OIC member countries as development financiers and emerging donors in achieving global development goals. The Symposium was sponsored by Turkish Airlines and Albayrak Media Group.